Nourishes and soothes the driest parts of the body;Creates a protective barrier against external aggressors;Nourishes dry skin. 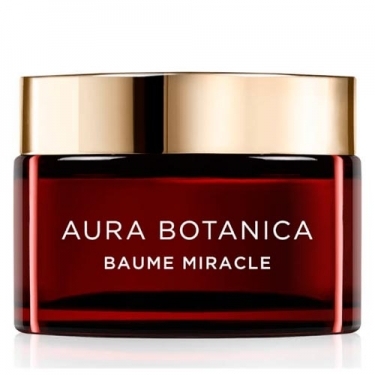 Aura Botanica Baume Miracle from Kérastase is a solid balm that melts between the fingers when heated, making it the ideal complement to re-condition dry hair between washes. Its rich yet light texture is quickly absorbed for intense and light care. Creates an additional layer of nutrition due to the presence of the fatty acid and vitamins present in the nut oil ingredient of Pará. The damaged fiber is softened and transformed, recovering healthy glow. When applied on dry skin, it leaves the skin instantly more nourished. The hair looks natural and free of beading. Daytime:Apply a small amount on the palms and warm up;Apply to dry hair lengths or dry body areas or locally.During the night :Massage the amount equivalent to the size of a pea in the dried lengths;Curl hair on towel to intensify penetration;In the Skin can be used as a targeted regeneration cream for very dry areas of the body: hands, feet, knees.